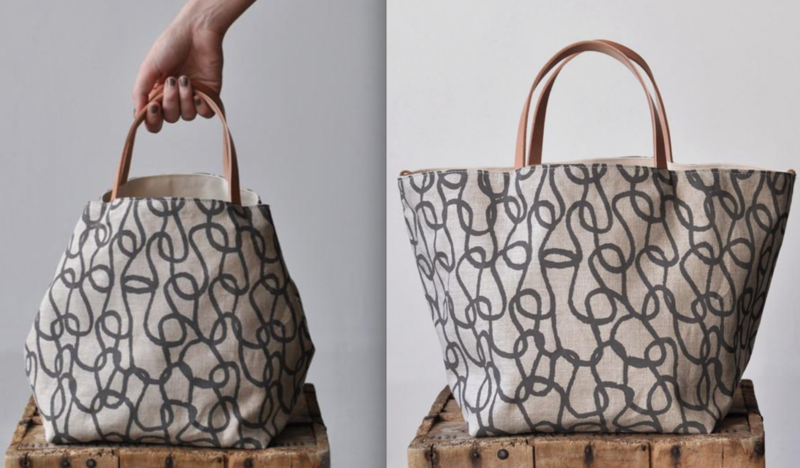 This nice and simple box tote is a great size to carry around, and also makes a good project bag. The tote can be left open, or you can use the leather tie to cinch in the sides, which also works as a closure. Made with Bookhou's original drawing printed with a warm brown grey solvent free ink. Dimensions: H 9.5 x W 8.5 x D 8.5 in. Top opening end to end is 16 in. Natural color vegetable tanned leather is 12 in. (30.48 cm) long with a handle drop of 5 in. (12.7 cm) - this leather ages to a honey color with use and exposure to light. A great companion in your bag to hold your essentials, or use it alone as a small clutch. Bookhou's original drawing printed on 100% linen in dark grey solvent free ink. Cotton canvas lining and brass metal zipper. Fabric: 100% linen - oatmeal color with 100% organic cotton canvas lining. Small up-cycled leather zipper pull. Dimensions: 10.5 x 7 x 1.5 in.